The Great Climate Change Debate: William Happer v. David Karoly, Part A | Watts Up With That? February 15, 2016 was the beginning of an in-depth debate on man-made climate change between two well-known experts in the field, Dr. William Happer and Dr. David Karoly, hosted by TheBestSchools.org. Both have been heavily involved in atmospheric research since the 1980s, but they have landed on opposite sides of the debate. Dr. Happer is a physicist who has specialized in the interactions of radiation with matter, a key issue in greenhouse warming and optics. Happer, Princeton physics professor emeritus, invented the sodium laser guide star used by astronomers and the military to reduce atmospheric distortion of light and was a co-author of an early book on global warming, The Long-Term Impacts of Increasing Atmospheric Carbon Dioxide Levels (MacDonald 1981). Dr. Karoly, University of Melbourne (Australia) professor, is a climate scientist who has been heavily involved in several IPCC reports and first described the famous “atmospheric fingerprint” (cooling in the stratosphere and warming in the troposphere) that shows rising greenhouse gas concentrations have an impact on recent surface warming. Although the fingerprint does not allow the magnitude of human climate impacts to be computed, it does allow us to infer that human CO2 emissions have some finite impact on climate. Unfortunately, Dr. Karoly backed out in the middle of the debate, so the responses to Dr. Happer’s statement and interview were written by Glenn Tamblyn, a blogger for the website skepticalscience.com. Is recent global warming unusual? How do we know the excess CO2, and other greenhouse gases, are from human activities? How do we know that the increase in CO2 and other greenhouse gases in the atmosphere have caused most of the recent global warming? Climate models have been used to compute the amount of warming caused by human activities, how accurate are they? How do we know global warming and more CO2 will have substantial adverse impacts on humans and the planet? Should anything be done to combat global warming? Karoly and Happer agree that climate changes, that the world has become warmer over the past 120 years, and that adding CO2 to the atmosphere will cause some warming. They also fully agree that the CO2 concentration in our atmosphere is increasing about 2 ppm/year, which is about half of human emissions. The other half is absorbed by the ocean and biosphere. These facts are not in dispute. They differ on the projected impacts of the warming and additional CO2. Happer thinks the impacts will be net beneficial and Karoly thinks they will be detrimental to humans and nature. We will unpack this disagreement into the six key questions listed above, then provide the arguments from each scientist. The first three parts have no “discussion and comments” section, my views on the debate will be in a final post, Part D. This is all about Happer and Karoly, with a little supporting material added from IPCC AR5 (IPCC 2013), other references needed for clarity, and Glenn Tamblyn’s replies to Happer. 1. Is recent global warming unusual? “There are a number of estimates of the hemispheric average temperature using different methods and different proxy data, not just the one shown [below, Figure 1] by Michael Mann and his collaborators. 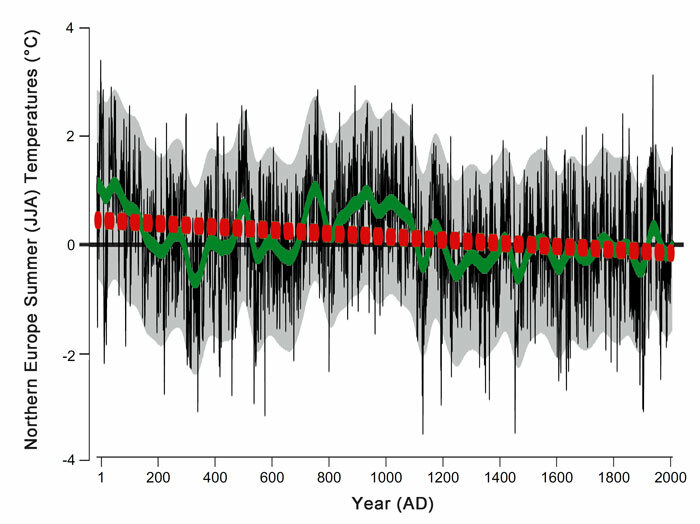 They all show that the period around 1000 AD was relatively warm and that the period around 1600 to 1800 was relatively cool, just as the Hockey Stick does. However, they all show that the increase in Northern Hemisphere average temperature over the twentieth century was larger than in any other century over the last millennium and that the last 30 years was likely warmer than any other 30-year period over the last 1000 years averaged over the whole Northern Hemisphere.” From the Karoly Interview. Figure 1. Source IPCC TAR Technical summary 2001, page 29. “The hockey-stick temperature record was conspicuously absent from the latest IPCC report, which speaks volumes. My guess is that the hockey stick started out as an honest but mistaken paper, but one welcomed by the global-warming establishment. They had been embarrassed for years by the Medieval Warm Period, when Vikings farmed Greenland, and when emissions from fossil fuels were negligible. A.W. Montford’s book, The Hockey Stick Illusion (Anglosphere Books, 2015), is a pretty good summary of what happened.” The Happer Interview. A precise global temperature record, that can accurately show a one-degree change in 100 years, of the past millennium will probably never be created, the temperature proxies available are simply not that accurate. While the MBH98 “Hockey Stick” is not used by the IPCC anymore, there are a variety of other reconstructions they do use to show the range of possible temperatures over the past millennium, some are shown in Figure 2, from the most recent IPCC report, called “AR5” (IPCC 2013). Figure 2. Various temperature reconstructions for the Northern and Southern Hemispheres and the globe. Source IPCC AR5, page 409 (IPCC 2013). Rather than just showing the MBH98 graph (Figure 1), Figure 2 shows 15 temperature reconstructions of the Northern Hemisphere to illustrate the variability. Several of the reconstructions show one degree or larger changes in less than 100 years, further the range of temperature estimates in many 100-year periods is larger than one degree. One extreme example is from 1400 to 1500 AD. The graph also shows three modern high-resolution instrumental global temperature anomalies from the 19th century to 2000. The display portrays the uncertainty in the proxy reconstructions and clearly demonstrates that one cannot definitively say the recent 0.9 degree rise in global average temperature is unusual. It may be unusual, but the data are not accurate enough to establish the fact. The various reconstructions clearly show the Medieval Warm Period (roughly 900 to 1150 AD), which is a matter of historical record. As discussed in the IPCC caption, the red lines are land-only reconstructions, orange are land only extra-tropical, the light blue are land and sea extra-tropical reconstructions, dark blue are land and sea all latitudes. Karoly disagrees with researchers that think the Medieval Warm Period (MWP) (~900-1200 AD) was warmer than today. However, the spread of values and the amplitude of the proxy temperature swings in Figure 2 shows we don’t know this. While historical records suggest Europe, Greenland and many other areas were warmer then, we do not have enough data to show the whole world was warmer. Estimates of temperature anomalies in the MWP, in Figure 2, range from -0.2° to +0.8°C. 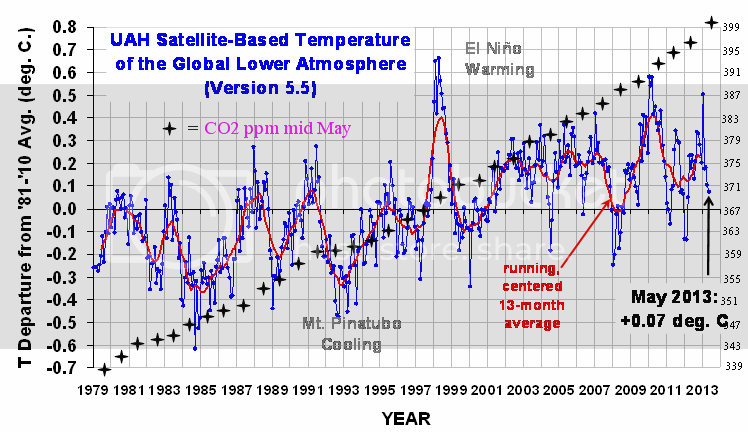 The records are ambiguous, Karoly could be correct, but the global average temperature during the MWP is unknown. Tamblyn also suggests that the speed of recent warming is unprecedented, but since the variability of the temperature changes in Figure 2 is larger than the recent warming and it is invalid to compare proxy temperatures to instrumental temperatures in any case, the assertion remains unproven. Further, the rate of warming from 1910-1945, before man-made CO2 was a factor, is nearly the same as the rate of warming from 1975 to 2005, which is a problem for Tamblyn. 2. How do we know the excess CO2, and other greenhouse gases, are from human activities? Karoly explains that the recent increase in atmospheric CO2 is associated with a decline in the ratio of the carbon isotopes 13C to 12C, which is expected if some of the CO2 is from burning fossil fuels since plants prefer 12C. Fossil fuels have less of the long-lived 13C isotope of carbon, since they are mostly made from decaying plant material. In addition, there is a slight decrease of atmospheric oxygen as one would expect from burning fossil fuels. Karoly also points out that during the last 800,000 years of the Pleistocene Ice Age, Antarctic ice cores suggest that CO2 levels have never been above 300 ppm. Thus, the current level of 400 ppm is very unlikely to have a natural cause, such as volcanic eruptions or CO2 out-gassing from the warmer oceans. Happer agrees that the observed increase in CO2 concentration in the atmosphere is due to human activity: burning fossil fuels and other industrial activity. In many ways these are at the heart of the debate. Stay tuned. IPCC. 2013. In Climate Change 2013: The Physical Science Basis. Contribution of Working Group I to the Fifth Assessment Report of the Intergovernmental Panel on Climate Change, by T. Stocker, D. Qin, G.-K. Plattner, M. Tignor, S.K. Allen, J. Boschung, A. Nauels, Y. Xia, V. Bex and P.M. Midgley. Cambridge: Cambridge University Press. https://www.ipcc.ch/pdf/assessment-report/ar5/wg1/WG1AR5_SPM_FINAL.pdf. MacDonald, Gordon. 1981. Long-term Impacts of increasing Atmospheric Carbon Dioxide Levels. Ballinger. https://www.amazon.com/dp/088410902X/?tag=tbs242-20. Mann, Michael E., Raymond S. Bradley, and Malcolm K. Hughes. 1998. “Global-scale temperature patterns and climate forcing over the past six centuries.” Nature 392: 779-787. https://www.nature.com/articles/33859. McIntyre, Stephen, and Ross McKitrick. 2005. “Hockey sticks, principal components, and spurious significance.” GEOPHYSICAL RESEARCH LETTERS 32. http://www.climateaudit.info/pdf/mcintyre.mckitrick.2005.grl.pdf. McKitrick, Ross. 2018. “Statement of Ross McKitrick.” https://www.rossmckitrick.com/uploads/4/8/0/8/4808045/nyc_lawsuit0.pdf. September 1, 2018 in Climate Change Debate, Climate News. Abstract. Forthright characterization of scientific uncertainty is important in principle and serves important practical purposes. Nevertheless, economists and other researchers commonly report findings with incredible certitude, reporting point predictions and estimates. To motivate expression of incredible certitude, economists often suggest that researchers respond to incentives that make the practice tempting. This temptation is the “lure” of incredible certitude. I flesh out and appraise some of the rationales that observers may have in mind when they state that incredible certitude responds to incentives. I conclude that scientific expression of incredible certitude at most has appeal in certain limited contexts. It should not be a general practice. That is how one develops and maintains integrity. People never hold it against you, never consider you less intelligent or learned if you explain clearly what you don’t know. Then they can believe what you do. It was apparently settled in Napoleon’s time. At the end of the day i say this; don’t worry about GW because there is nothing we can do about it anyway, and it is beneficial if anything. “The material provided by TheBestSchools is very long, often repetitive, and poorly organized.” That’s what passes for the best schools. Karoly, when later asked why he ran away in the middle of the debate could only sqwawk a feeble “buk-buk-buk-bukaaa”! Perhaps Karoly bailed because he actually listened to Happer and realized that Happer was correct and Karoly was just plain wrong – which he was. Yes, increasing CO2 may cause some warming, but that warming will be mild and net-beneficial to humanity and the environment. There is ample evidence that this is correct, and NO credible evidence to contradict this conclusion. Shall we pull out all the critiques of the so-called “independent” reconstructions from Cimate Audit? It won’t be pretty. Climate Audit is blog, I’d prefer you to cite scientific articles, not opinion pieces. Whether or not it’s a blog is irrelevant. Are the criticisms correct or not? McIntyre provides all his data and code, so feel free to invalidate his results. The DonK is complaining on a blog about someone citing a blog. Are we supposed to take his comment seriously? I’d say NOT. Even funnier that you quote Wiki, but anyway. The problem with these “Independent” reconstructions is that they are nothing of the sort. Can you really, with a straight face claim that “Jones and Mann” is independent of “Mann and Jones”? Go and read who all the authors are of these papers and you’ll see that many are the same people swapping their names around. Once you understand that it’s the same people recycling the same data the “agreement” between papers is quite obvious and not a particularly powerful argument. The Wegman report actually looked into this matter and graphed the proxies used in various papers. Read the report and see. It only counts if it is on a site that you approve of. I have excerpted the Wegman report below – that should be sufficient. Donald L K ‘s above attempt to rehabilitate Piltdown Mann’s disgraced hockey stick is an extremely bold lie, especially when published on this site. Acolytes of his, using the same data and the same techniques come to the same conclusion. Thank you for your nonsense Donald – we knew when “Piltdown” Mann and friends published the Hokey Stick that it was false nonsense – subsequent conduct by the Hokey Team and related events suggest that it was deliberate fraud. Your “article” is not science, it is an opinion piece. You have not addressed Wahl & Ammann 2006. You have not addressed Pollack and Smerdon 2004. You have not addressed Anders Moberg 2005. You see Allan, there are many studies subsequent to MBH98 that have confirmed its findings. How about you post a scientific study (not a blog post) that has a valid reconstruction from data that REFUTES Mann? Oh, Allan, how about Ljungqvist et al. 2012 ? or Marcott et al. 2013 ? Wasn’t the Marcott 2013 paper the one where Marcott said the last 100 years were not statistically robust? Marcott also has very low temporal resolution, which means centennial changes aren’t seen. Worthless. Hmm. The NAS said M&M’s critiques were correct, meaning MBH has no statistical value. So all the studies that “confirm” it came up with the same wrong answer. Wonderful. hardly surprising they agree given the proxies and methods used to arrive at a similar conclusion. Finding “evidence” of the MWP and the LIA does not refute MBH98, and correlations are not causative with respect to cosmic rays. Your citations prove nothing other than groupthink. Finding that MBH98 can only get a hockey stick by grossly overweighting one tree ring series (bristlecone pines) in one small area of the southwest US DOES invalidate it. Donald. If MBH 98 contradicts the written records, then it is invalidated. Real records, historical records trump a proxy reconstruction. Real records show that certain places were much warmer than today, MBH98 says they weren’t. MBH98 loses. It wasn’t called the “Little Ice Age” because historians thought it was a cool sounding name, but because it was cold, very cold. The like of which has not been see in 200 years. During the retreat from Moscow, starving French troops could cut strips of flesh from the walking horses to eat. The horses didn’t notice and the blood froze instantly healing the cuts. Recent drilling in the Alps discovered mixed mud, horse and elephant dung in a pass, a passage that Hannibal used. The area is under 30 feet of ice and snow today. Guess what? It was warmer then. People can argue about the statistics all they want, I really don’t care. Historical records and archaeological evidence says that MBH is wrong. Even worse, the Grande Armee retreated back over the battlefield of Borodino, to eat the frozen meat. When Mann et al eliminated the MWP and the LIA from the historic record, their paper MBH98 was obviously in error. It was a remarkably bold falsehood, and was for a while adopted by the IPCC’s warmist propagandists as their centrepiece – but even they avoid it now. The Wegman report and others utterly savaged MBH98 – and you Sir show remarkable brass by trying to raise it from the dead. If you ever pull that off, it will be one of the greatest deceptions of all time. I salute your boldness, Sir, but not your intellect or your integrity. Below is the evidence of how totally false your above allegations are. Who are you writing your lies for Sir? Certainly not the experts who post on this site and who have studied this subject for decades – your target audience must be the Ryan’s and the Griff’s, scientific illiterates who have guzzled the warmist Kool-Aid and keep regurgitating it, as you do. Shame on you Sir! The Wegman Report fully supported McIntyre’s work and declared that the much-touted (by-the-IPCC) Mann hockey stick was broken. IT IS CLEAR THAT MANY OF THE PROXIES ARE RE-USED IN MOST OF THE PAPERS. IT IS NOT SURPRISING THAT THE PAPERS WOULD OBTAIN SIMILAR RESULTS AND SO CANNOT REALLY CLAIM TO BE INDEPENDENT VERIFICATIONS. Could you please dispense with the “all caps?” It makes you look like a petulant teenager yelling on the Internet. As we all know, nobody would ever make charges unless they were true. That’s why we no longer bother with trials for criminals. The difference between opinion and scholarship is apparently, whether it supports what you want to believe. More lies from Mr. Sketchley – absolute BS. William M Connolley polluted Wikipedia with his false propaganda on climate topics for years. Much of his false climate pollution apparently remains on wiki. Edward Wegman is an eminent scholar and statistician. Your continued slanders of Dr. Wegman and his committee are ignorant and offensive. I have CAPITALIZED certain words below because you are possibly otherwise incapable of understanding them – perhaps you too have problems reading lower case letters, cursive etc., apparently a common trait among the many illiterate and innumerate minions of the warmist camps. Have any factual parts or conclusions of the Wegman Report ever been refuted? The Wegman Report is “opinion,” not science. You know full well opinions can never be “refuted.” Kinda like blog posts. Thanks Keith so much for pointing this out. You’ve demonstrated that the media circus commonly known as “climate science” is not science. The Wegman Report is kinda like the so-called “97% Consensus” of opinion that alarmists love to insist can never be “refuted” because, after all, “it’s the consensus”. The version of orthodox climate science presented to the public by politicians, journalists and actors who play scientists on TV consists chiefly of a bunch of opinions validated as being “true” by the same people doing the presenting on the grounds that “most scientists” share this opinion. The Nature article doesn’t say one word about the content of the Wegman report, only that parts were copied, which is “not done”, only if you don’t like the message. The point is that many of the authors (and the reviewers) of the reconstructions are each others co-authors and a small group, using the same proxies and (wrong) methods over and over. That doesn’t tell us anything about the real global temperature in the MWP or earlier periods. All scientific papers contain opinions, Keith, and many are chock full of ’em, in my opinion. Keith, I capitalize important elements so that functional illiterates in the warmist camp, who never learned lower case letters, might be able to read them. when addressing people that behave like petulant teenagers sometimes shouting a bit may get their attention. OK, NOW THAT I HAVE YOUR ATTENTION BIT CHILLY…….. Yes, it is important to notice that “Warmer climates are a good thing.” A BIT CHILLY is a bad thing for most human activities. If you do the same thing as they did then you get the same answer. Its not exactly informative but might con those who see these reconstructions as being measurements. The Wikipedia entry on the North report was interesting. It paints that the North report found that there was no doubt that warming occurred over the past 400 years so “contrarian” complaints about the hockey stick are unjustified (which is that the MWP ending about 700 years ago was erased). Even those involved have since made large changes to their reconstructions. I suppose in a spiritual sense it is some consolation that Keith Briffa seemed to have rediscovered his professional compass and ethics to some degree before he passed. Perhaps a tiny bit. Too bad he didn’t have the balls to denounce the alarm publicly. False Alarm that he helped produce. Yep by using spurious methods to exclude series with high mediaeval values. Then there was Gergis et al, which used an arbitrary screening method on the Law Dome proxy series, but not the other series, an exclusion which gave a hockeystick result that had no “diluted message”. The primary justification for excluding proxies with high mediaeval values is that they don’t have a good match to the modern thermometer record, but that is not and never should be a justification. If a series has a match to the modern record, that does NOT mean it is accurate for the last 1000 to 10000 years. That is patently obvious, and that was why Mann and co deleted Briffa’s post 1960 data, because it went down (concealing the uncertainty of the proxy series, no excluding it because “it did not match the modern record, like pages, he kept what he liked and deleted the rest, which is what I call scientific fraud), and one wonders what Mann’s proxies did after 1970 too, but we wont know. Remember this is a man who used a series upside down intentionally in my opinion, as it is almost impossible to do that by accident. So, exclude all the series that have high mediaeval values and splice it to the modern thermometer record and you get hockeysticks. That’s doubly true when one can show that the modern record is hopelessly polluted my micro and macro conditions in the regions surrounding the sensor. Not to mention a mediocre attempt to maintain equipment and calibration logs. Except for the Germans, who remain guilt-stricken over Hitler and WWII, humans never voluntarily choose less prosperity. Electric bills would become far more burdensome if fossil fuels were to be abandoned, so this will quite simply never happen. That’s fake psychology. Trump voluntarily dumped Paris, foisted upon the USA by Obama. The same Green nut wagon is still rollin’ along on 3 wheels in the EU. Dr. Schellnhuber, CBE, awarded personally by the Queen in 2004 at the Berlin Embassy, wrote the German Great Transformation, and the Pope’s paean to Gaia, Laudato Si. To say this is some Freudian nonsense just fake analysis. Macron’s Hulot resigned, so maybe just 2 wheels. On the other hand, the OCO-2 satellite shows that there is considerable outgassing of CO2 in the oceans, particularly along the coasts and in the tropics. Upwelling brings to the surface waters that aren’t just reflective of the polar atmospheres a millennium ago. As the downwelling polar waters move towards the Equator, they are subject to a rain of organic detrital material, sometimes referred to as ‘marine snow’ by oceanographers. Much of this material is derived from dead photosynthetic organisms that selectively incorporate 12C rather than 13C. Thus, the material raining down on the abyssal plains is isotopically similar to that which made fossil fuels! Most of this material is oxidized and converted to CO2 during its downward fall, where it is dissolved in the cold, deep water. When it comes back to the surface as upwelling water, and the excess CO2 outgasses, I would expect it to have an isotopic signature enriched with 12C and probably not much different from the CO2 resulting from the combustion of fossil fuels. I don’t think this isotopic-preference claim has been examined in the detail required to support an exclusive anthropogenic source. Yet another example of unexamined assumptions. Interesting thoughts. But, the amount of CO2 created by burning fossil fuels worldwide is known and the increase in atmospheric CO2 and the decrease in O2 are in the ballpark of what is expected from this, after subtracting increased biosphere uptake. Although the biosphere and ocean uptake of excess CO2 is increasing rapidly and who knows where we will wind up. Andy, how does one get an accurate estimate of biosphere uptake? That sounds even less accurate than measuring the Earth’s average temperature. It would most certainly be hard to compare present biosphere uptake with any possible estimate of historical biosphere uptake. Those questions asked, I am sorry I cannot imagine that the amount of fossil fuel burned is known within plus or minus 25% if that. For example, we don’t even know how much coal was being transferred from NOKO to China. We know that China’s data, at least that given to the rest of the world, are whatever they believe works for China on a given day. Steve is correct, once compiled, the fossil fuels burned add up to 4PPM per year. But, the CO2 is only going up by about 2 PPM per year, the rest is increased uptake by the biosphere and the oceans. CO2 increases are responsible for an estimated 70% of the greening we are witnessing. It seems unlikely the reports by producers and sellers would take into account the burning of thousands of uncontrolled coal fires all over the world, which must produce a fairly significant amount of CO2. As I pointed out in my first guest editorial in WUWT, there are numerous underground coal fires burning throughout the world. One estimate I read for a single fire in China was that the single fire contributed more CO2 than all the automobiles in the US. In any event, those poorly characterized sources aren’t included in the production figures of anthropogenic CO2. Coal mining waste, even though it doesn’t actually burst into flames, is continuously oxidizing, contributing CO2 to the atmosphere. Similarly, there are huge quantities of methane that are flared off (burned) at oil wells throughout the world, all contributing CO2, that aren’t a part of the production record of fossil fuels. The production figures only provide a lower bound on CO2 from fossil fuels. Again, one of the deficiencies of the accepted Carbon Cycle. The net CO2 amount absorbed by the biosphere is known with reasonable accuracy thanks to the oxygen balance and the necessary increased accuracy of the oxygen measurements (better than 1 in 1 million). On short term, the biosphere may be a temporary source of CO2 during El Niño events. As the biosphere is a net sink for CO2, that increases the 13C/12C ratio of the atmosphere. So do the oceans: the average deep ocean δ13C is 0 to +1 per mil, of the ocean surface +1 to +5 per mil, fossil fuels -26 per mil, the atmosphere: pre-industrial -6.4 per mil, since 1850 rapidly sinking to below -8 per mil nowadays, in about exact ratio to fossil fuel burning. In fact, the amount of CO2 created by burning fossil fuels worldwide in known to a much higher level of fidelity than the natural global sources and sinks of CO2. It’s nice that we know how much fossil fuel we burn because it is measured economically, but the comparison to the natural budget is difficult because of the unknowns in that arena. You find that about the smallest component of the overall CO2 budget is the best known by an order of magnitude or more, and we find a situation akin to adding 4 to 400. Those fires do that already for thousands of years, without much influence on CO2 levels or δ13C (a measure of the 13C/12C ratio in the atmosphere). They are absolutely terrible for replacing data! Finance, manufacturing, refineries, assembly plants, etc. consider estimates to be useful for limited preparations. Which is why the quote “No plan survives contact” is a clear warning against believing “estimates”. They are only to provide a working start, not decide global effects! Alleged global CO₂ estimates are based upon estimates, based upon assumptions, based on limited knowledge, etc. etc. The fuel itself is estimated. The consumption rate is estimated. The CO₂ emission rate is estimated. Only a few countries, mostly western civilization, provide somewhat accurate base estimates. The majority of global countries are incapable of determining reasonable starting estimates. Quite a few countries are untrustworthy or even duplicitous. It is not their desire to share accurate internal information. Earth’s carbon and carbon dioxide active regions range from tens of miles deep, throughout the oceans and into the troposphere. Man’s participation in this active region is analogous to spores on a peach. Claims otherwise are claims based on ‘Argumentum ad Ignorantiam”, the argument from ignorance and represent the hubris of man. As a Manager of Budget, I prepared financial and work plans for the following year. I also had to explain, in detail, why reality divulged from planning; ever accounting period and every quarter during the following year. But, that was not a witch hunt! Instead it was to help managers and supervisors to understand why, where they made bad decisions and where they made great decisions. Hours of work, per employee, per vehicle, per building, etc. etc. etc. And we knew exact numbers going into estimating. This wasn’t piddling work. Our division had 4 large plants, 400 plus offices with an annual $750 million revenue/expense budget. Yet, desk jockeys believe they can estimate human caused CO₂ by using gross assumptions with almost zero verification. A claim that ranks with how many angels can dance on the head of a pin. Meanwhile, the OCO-2 satellite barely registers man’s activities? I thoroughly agree with your analysis of the uncertainties of macro estimates applied to real-world micro realities. I had a similar business experience as commercial director of an electrical contracting company whose senior estimator proposed that we enter a tender for a large shopping mall job on the basis of cost + 5%. I said no way did we know our costs accurately to within 5% on a job that size, over such a protracted construction time – we need to go in at estimated cost + 20% minimum. The board of directors over-ruled me and went with the costs + 5% pricing. We lost so much on that job it eventually sent the company broke. Acting on numbers pulled out of derrieres has tragic consequences for lots of people. The fossil fuels inventories are somewhat better than guesses for the simple reason that there are (heavy) taxes on fossil fuel sales. Each type of fuel further has its typical CO2 release when burned. 1940 – 2,300,000,000 est. ___ ____ 300 ppm est. Fact #2 – human generated CO2 releases have been exponentially increasing every year for the past 60 years (as defined by the population increase). Fact #3 – the burning of fossil fuels by humans has been exponentially increasing every year for the past 60 years. (as defined by the population increase). Fact #4 – a biyearly or seasonal cycling of an average 6 ppm of atmospheric CO2 has been steadily and consistently occurring each and every year for the past 60 years (as defined by the Mauna Loa Record and Keeling Curve Graph). Fact #5 – atmospheric CO2 has been steadily and consistently increasing at an average yearly rate of 1 to 2 ppm per year for each and every year for the past 60 years (as defined by the Mauna Loa Record and Keeling Curve Graph). #5 – there is absolutely, positively no, per se, “human (anthropogenic) signature” to be found anywhere within the 60 years old Mauna Loa Atmospheric CO2 Record. And, NO “human signature” …… = …… NO “anthropogenic” atmospheric CO2 increase. It may be a spurious correlation, but it exists, nevertheless. That is a cause. To say otherwise is flat-earth kooky. Clyde S, …… your cited graph is little more than a silly attempt by a miseducated person …. or a devious attempt by learned pro-CAGW person …… to convince the clueless and gullible that the “junk science” claims concerning atmospheric CO2 are based in factual science of the natural world. 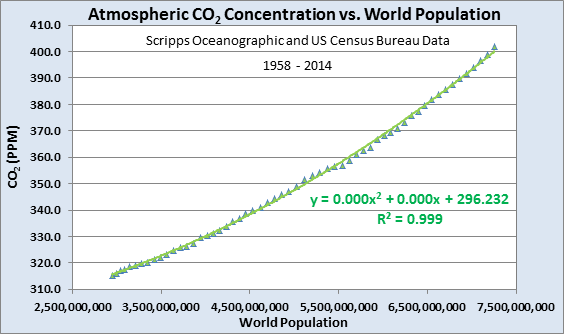 The graph is FUBAR because it portrays a correlation between world population “quantity” and atmospheric CO2 ppm “quantity” which is irrelevant, immaterial and asinine simply because that is akin to comparing “apples to rutabagas”. And ps, Clyde S, … iffen you were to “plot” the average yearly increase in the temperature of the ocean waters for the past 60 years, relative to the average yearly increase in atmospheric CO2 ppm for the past 60 years,…….. I am absolutely, positively sure that your graph would show a “direct correlation” between the two. While I’m open to alternative depictions for the relationship between CO2 and population, I was presenting something that directly addressed YOUR point #5. However, I’d like to point out that population is a result of longevity of individuals being added at a rate that exceeds the rate of removal, and CO2 concentration is a result of the longevity of molecules being added at a rate that exceeds the rate of removal. Here, read this, apparently you ignored it in my above post. Clyde, if we assume each person emits one (1) pound of CO2 each year, therefore, in 1960 anthropogenic CO2 emissions totaled 3,039,451,023 pounds …… and atmospheric CO2 was 316 ppm. And in 2017, 57 years later, CO2 emissions totaled 7,550,262,101 pounds …… and atmospheric CO2 was 407 ppm. And the yearly increase of CO2 in 1960 was an average 1-2 ppm for 3.0 billion tons of emissions. Whereas, the yearly increase of CO2 in 2017 was still an average 1-2 ppm for 7.6 billion tons of emissions. So Clyde, please explain how it was possible to emit an additional 4.6 billion tons of CO2 in 2017 without it affecting the “average yearly increase”. So Clyde, you take a close “look see” at the Keeling Curve Graph and/or the Mauna Loa Record …… and then “point” out to me wherein you think is a plainly visible “signature” of human emissions. The average human emissions were 1 ppmv/year, the increase in the atmosphere 0.5 ppmv/year in 1960. Both quadrupled in the past 60 years, thus average the sinks also increased a fourfold, as the extra CO2 in the atmosphere also increased a fourfold. Shur nuff, Ferdinand, …. shur nuff, …….. and you “reverse calculated” those two (2) ppmv/year quantities like 50 years “after-the-fact” via highly questionable records and lots of guesses and assumptions. And lucky, lucky for you that your “fuzzy math” calculated 1960 “ppmy” quantities were pretty much exactly one fourth (1/4) as much as your present day (2017) “fuzzy math” calculated “ppmy” quantities. Shur was pretty nice, Ferdinand, …… the way your “calculated results” worked out in your favor. Miracles of miracles, ….. HUH? OH, … my, my, ….Ferdinand, …. please tell me what it is about the termites of the world that you refuse to give them any credit for their yearly emitting tenfold (10x) more CO2 than humans do? Just plot the trendlines and you will see that the increase in the atmosphere 60 years ago and today is about half human emissions and in both cases a tripling to quadrupling of quantities. The large variability in sinks may hide that in years with large temperature excursions, but that zeroes out in 1-3 years. what it is about the termites of the world… … emitting tenfold (10x) more CO2 than humans do? Termites like molds, bacteries, other insects and animals of any kind are part of the biological cycle and can’t eat more wood (thus produce CO2) than was first grown by absorbing larger quantities of CO2 than can ever be released by termites… The biosphere balance is more sink than source, whatever the termites do. Ferdinand, you just “choose n’ cite” your conjured up “fanciful facts” in you posted commentary where they serve your best interest. Ferdie, if as you claim, ….. that the “atmospheric CO2 decay rate is about 51 years”, ….. then what you are actually claiming is that 89% to 98% of all human emitted CO2 from 1958 to present is still resident in the atmosphere. Your idiotic “junk science” tripe and piffle is really getting on my nerves. SURPRISE, SURPRISE, ….. JA, ….. but I don’t cater to the “liberal” base of climate delusionists. Of course, there is no correlation between CO2 emissions and increase in the atmosphere, as there is no correlation between a straight line (CO2 emissions) and a lot of noise (caused by temperature variability). That noise is only +/- 1.5 ppmv around a trend of +90 ppmv. Thus says nothing about the cause of the trend. Ferdie, both of your cited graphs are “chock full” of data “points” which there is no way in hell you can substantiate as being actual or factual. It is not just me, …. but the stomata CO2 proxies are literal proof that your pre-1958 “guesstimated” atmospheric CO2 ppm quantities are FUBAR, to say the least. human emissions might have been underestimated, thus only more CO2 released than plotted. CO2 levels up to 1958 are from the high resolution (less than a decade) Law Dome ice cores with a repeatability of 1.2 ppmv (1 sigma) and a 20 year overlap (1960-1980) with direct measurements at the South Pole. There ya go again, Ferdie, …… with your posting of “convenient facts” best suited for “proving” (CYA’ing) your current claim. Your above “claim” is that atmospheric CO2 is ingassed (absorbed) into the “wintertime” snowpack in Antarctica and thus sequestered in the glacial ice and is currently being measured to determine past atmospheric CO2 ppm quantities. Whereas tomorrow you will AGAIN be “claiming” that the biologically generated CO2 is being outgassed (emitted) through the “wintertime” snowpack in the Arctic, as well as in other parts of the “wintertime” Northern Hemisphere which results in the biyearly (wintertime/seasonal) increase in atmospheric CO2 ppm. You truly believe that your use of selective “facts” ……. permits you to “have your cake and eat it too”. Those correlations could be coincidence. Any oxidation, whether inorganic or organic, will use up oxygen. It doesn’t require combustion. The CO2 increase isn’t a good match for that produced by fossil fuel combustion. It is a fraction, and it is speculation that unspecified ‘sinks’ are preventing all the anthropogenic CO2 from showing up in the atmosphere. The quantification of the Carbon Cycle is another unexamined assumption. There CO2 increase is the difference between fossil fuel emissions and the net sink rate in nature, whatever the distribution between oceans and biosphere. The net sink rate is highly linear: proportional to the extra CO2 in the atmosphere (whatever the source) above the long term equilibrium between ocean surface (and biosphere) for the current average sea surface temperature (about 290 ppmv) with an e-fold decay rate of about 51 years. That is too long to absorb all human emissions in the same year as emitted, thus the remainder accumulates in the atmosphere. Ferdinand, ……. how’s come that “human emitted remainder” in CO2 emissions ALWAYS seems to accumulate at the start of “springtime”, in mid-May, in the Northern Hemisphere?. How’s come that human emissions “remainder” can’t be detected in July, …. or September, ….. or even December? Iffen the absorption of CO2 by the biosphere can’t keep up with the emissions of CO2 by the humans, ….. then that accumulated difference should be measurable from June thru December and on thru mid-May of the next calendar year. And the ML Record doesn’t show any of the aforesaid atmospheric CO2 “continuous accumulations”. Why not, Ferdie, why not? how’s come that “human emitted remainder” in CO2 emissions ALWAYS seems to accumulate at the start of “springtime”, in mid-May, in the Northern Hemisphere?. Because what accumulates is not alone the CO2 emissions from fossil fuel burning, but the sum of biosphere release of decaying vegetation minus the first photosynthesis of NH spring and the release of CO2 from the oceans with increasing seasonal temperature, plus a part of human emissions. Ferdinand, you are a prime example of an ole adage of ….. “You can’t teach an old dog new tricks”. I’ve told you before that microbial decomposition of dead biomass is severely restricted during the Northern Hemisphere’s “fall & winter” seasons (September thru March). And I’ve also told you that the photosynthesis activity of the NH spring ….. DOES NOT and CAN NOT begin until mature leaf foliage has developed on the “green growing” biomass …… which doesn’t occur until mid to late April at the earliest in the mid and northern latitudes. In fact, the article says,”There was no consensus on whether the oxygen cycle before humankind began burning fossil fuels was in or out of balance and, if so, whether it was increasing or decreasing,” In other words, like so many aspects of climatology, the past is known so poorly that any claims based on past behavior have little credibility. That -interesting- research was about very long term O2 changes (0.7%) over 800,000 years, not the current very fast O2 changes over the past decades: 0.02% per decade, or 0.7% in 350 years.. I think your explanation has merit and is worth further study. The problem in this matter is that almost all the data is rubbish, and not fit for scientific study. This precludes a serious scientific debate. Take for example the MWP. The claim that the MWP is simply a Northern Hemisphere event is not based upon evidence from the Southern Hemisphere that it did not happen in the Southern Hemisphere. Instead, it is based upon the fact that there is little evidence from the Southern Hemisphere (since it is mainly oceans and was sparsely inhabited with people who kept written records). Absence of evidence is not proof that something did not happen. Further, even if the the MWP is simply a Northern Hemisphere event, we know of no reason to explain this. If CO2 is the control knob, and if CO2 did not significantly rise during the MWP, what caused the Northern Hemisphere warming? Again, AGW proponents never explain this. I have never seen an explanation for the temperature profile of the Holocene and what caused the Holocene Optimum. Yet further one cannot begin to compare proxies with low resolution, against thermometers with high resolution. Of course, with low resolution one cannot extract rates of warming. Everything is muted and smoothed. It would take pages to explain the problems with the land thermometer reconstructions and the land/ocean thermometer reconstructions, but it is noteworthy that the US has shown that the 1930s were the warmest period. Of course, the US represents only a relatively small area of the globe, but materially, it is a large land mass, with many and varied geographical features and climate zones, and there is no obvious geographical and/or topographical features that would render it an outlier for the mid latitudes of the Northern Hemisphere (say 25 to 50 deg North). Given that the US has the best spatial coverage and historic data, giving it the best and most complete thermometer record, any AGW proponent should be obliged to identify the matters which renders the US as an outlier for Northern Hemisphere mid latitude response. The fact is that, pre the satellite era, there is no global data worth a pinch of salt. From a historic perspective one should only look at the Northern Hemisphere, and I am far from convinced that there has been any warming since the 1930s/early 1940s. If that is the case, given that nearly 99% of all manmade CO2 emissions have taken place since then, it would suggest that Climate Sensitivity to CO2 is low, if there be any sensitivity at all. PS. I am well aware that there is a plethora of evidence and papers that suggest that the MWP was global and not restricted to the Northern Hemisphere. Good points. Probably the MWP was global, but this is based largely on historical records and glacial termination studies. The various proxies we use, ice cores, tree rings, lake sediments, shell chemistry, etc. Do not show it clearly, which is confusing. I suspect that the problem lies with the proxies, they are very low resolution and low accuracy and we are looking for a 300 year anomaly that may only be one or two degrees. It could easily be smoothed or averaged out of existence in the proxy data. In many ways Karoly and Tamblyn are applying a micrometer to a brick. The evidence is quite good that the MWP was global, only more prominent in the higher latitudes of the Northern Hemisphere. The question if the MWP was warmer than the present cannot be solved with the information available. I suspect it wasn’t, based on Moberg et al., 2005 reconstruction of NH temperature for the past 2000 years. Thank you for the debate transcription. It is interesting. Even if Karoly is right and modern global warming is the most prominent since Roman times, that doesn’t make it unusual except to our eyes. Millennial-scale warming and cooling periods of several centuries are common during the Holocene. That it hasn’t happened in quite a few centuries doesn’t mean that it is our fault. Not enough info to decide whether MWP was warmer than today? Well, Greenland is not yet warm enough to allow the farming that was carried on by the Vikings 1000 years ago. Ancient whale skeletons are found in Arctic near-shore waters that have only recently been ice free in the summer, not frozen over all year. That Greenland was warmer during the MWP than now does not mean that the world was warmer than now during the MWP. A thousand years ago insolation was higher at Northern high latitudes due to Milankovitch orbital changes. The ancient whale skeletons are from the Holocene Climatic Optimum, a period that was clearly warmer than the present. I have looked at the issue with neutrality and I can honestly say that I have not found convincing evidence either way. I do not know if the MWP was warmer than today. It was probably similar to sometime in the 20th century. Experts that have looked at the issue have reached the same conclusion. That is why the most usual claim is that we are at the warmest in the past 1000 years. That is probably true. You selectively picked Greenland’s ice core measurements to allow yourselves to pretend the MWP was a “northern European” thing, that the evidence comes from a single source, and that the “evidence” cannot be used definitively to claim the MWP was warmer than today’s MWO because today’s warmer temperatures have not reached their maximum. Your selection of that single piece of evidence won’t work here. None of the four “warming” periods you mention are observable in the Antarctic ice cores. Thank you for your link. More later. If the MWP was warmer than today, and lasted for a longer period of time, then the tree stumps being uncovered at the terminus of the glaciers in Glacier National Park would carbon date to Medieval times. They don’t. indicated by tree-ring studies at several localities in the park. No, your claim is NOT supported by your own reference: The most recent morraines (rocks deposited by the terminal edge of a retreating glacier) were deposited as recently as the late 1800 (1850-1890 warm period). NOT the far more ancient trees exposed above the Mazama and earlier Mt St Helens ash deposits. Trees re-forest above an exposed the newly-exposed ground very, very quickly when a glacier retreats: See the large “forests” of regrowth at the base of the Middenhall Glacier in suburban Juneau that have grown back since its mid-century retreat. (Well, the Middenhall Lodge as well.) So, those exposed trees may have come from not just one retreat from many dozen glacier retreats. The moraines deposited by one glacier are wiped out by a later expansion; the advances made by one (or many) expansions are ALL wiped out by one single later expansion that grinds all the previous moraines into dust and re-re-deposited rock falls. You missed the whole point there Mr. RACook. ALL of the carbon dating is either recent (mid 18th century) or 10,000+ years BP. My point is that NOTHING dates to Medieval times. If it was warmer, and warmer for a longer period of time, you’d be finding organic matter in the moraines that dates to 950-1250 AD as re-vegiation would have occurred. Keith, glaciers cover tree stumps when they advance, not when the retreat. Glaciers are retreating from their highs of the Little Ice Age, therefore it is logical that the trees being uncovered were covered during that advance. No contradiction, just a basic misunderstanding on your part. More important, since the glaciers in each local area have advanced and retreated about every 1000 years since the last major Ice Age (12000-odd years ago), there have many dozen different glacier advances and retreats – every one of which covers and uncovers trees and bogs and rosks many dozen different times. Or perhaps only a few times. Or perhaps only a dozen times, but the ninth retreat and tenth advance were more severe than the 6th, 7th, and 8th, so those glaciers wipes out the early evidence of trees left behind under one particular glacier. Or perhaps not. Or perhaps that one glacier was the only one surveyed in that particular rock hollow that left behind trees killed by nbr 6 advance. Yes MarkW, they cover them when they advance. If the MWP was warmer than today, the tree stumps that get covered by advancing ice would carbon date to 850-1250 AD. They don’t date anywhere near that point in time. Yup, and the dates do not show a de-glaciation event from the Medieval period. Anybody that claims the MWP was warmer than today has to show that in areas that are de-glaciating now, de-glaciated circa 950-1250 AD ALSO. There are lots of local proxies contradicting each other. Some saying it was warmer and some that it wasn’t. And a lot of proxies have problems to represent the most recent decades. Show me a single peer-reviewed scientific article where it is SAID that the MWP was globally warmer than now based on evidence. Moberg et al. 2005 used a bunch of proxies from the NH and concluded that MWP was not warmer even there. His reconstruction ends in 1970 because of the mentioned problems with proxy tops. It is missing the second leg of warming of the 20th century. Nonsense. As mentioned, there are hundreds of papers showing the MWP was a worldwide, multi-century event. We are not discussing that. I also agree that the MWP was global and multi-century. What we are discussing is whether there is good evidence demonstrating that it was warmer than the present. Pointing to a list of articles does nothing to prove your point. I have many of those same articles in my hard-drive and I have examined a good deal of them. That is why I say I have not found firm evidence that can support that the MWP was warmer than the present. My experience is that people that sustain that opinion is mostly because it fits what they want to believe and have selected some partial piece of evidence to support it, like for example an ice core record. If Greenland was the only place we knew of that was warmer, you would have a point. However we have papers studying sites all over the world that show the world was warmer during this period. And we have papers all over the world that show that it wasn’t. And you are ignoring those. That is called selection bias. The only way to get over selection bias is to look for evidence that contradicts your hypothesis, and if you find it then your hypothesis is weak. Most people aren’t trained to do that. Even a lot of scientists fail to do so despite being an important part of the scientific method. 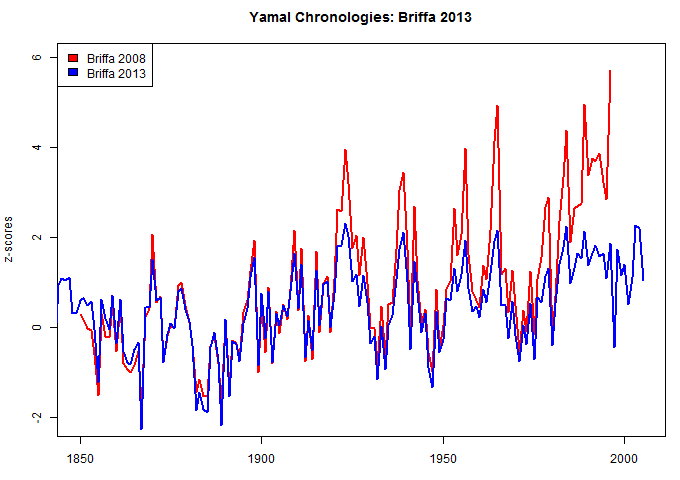 With the type of evidence we have we cannot say which period was warmer. If you go by the reconstructed CET, the Modern WP has yet to equal, let alone surpass, the Medieval. There has not yet been a 50 year interval in the Modern WP as hot as at least three such periods during the Medieval. The interval 1951-2000 might have come close to one of them. The period 2001-2050 naturally will depend upon whether the past warming cycle ends, followed by a cooling phase counter to the secular trend since c. AD 1850. I don’t think the MWP was any less global than the current warm period. Every distribution map I’ve seen shows today’s so called global warming crisis is in reality completely driven by arctic warming. The SH and Antarctic are flat or cooling. Karoly also points out that during the last 800,000 years of the Pleistocene Ice Age, Antarctic ice cores suggest that CO2 levels have never been above 300 ppm. It seems to me that this statement is proof that CO2 doesn’t have much to do with temperature. During those 800,000 years of the Pleistocene, which, if I remember my historical geology correctly, was characterized by several glacial advances and retreats, that continued into (through??) the Holocene. If “global” temperatures varied as much as necessary to advance and then melt massive ice sheets, while the CO2 levels remained relatively flat (280-300), how can CO2 be that magical climate control knob??? The assumption that Antarctis ice cores suggest that CO2 levels have never been above 300 ppm, seems to be based on junk science. At a depth of 100 metres there will be CO2 clathrates in the ice, which will decompose when the core is extacted. There is also the matter of isotopes migrating in the ice. See Jaworowski et al 1992, and the latest paper from Hermann Harde. Please, let Dr. Jaworowski rest in peace, together with his ideas about CO2 in ice cores. Agreed. The collective “global” surface temperature record is useless. There are scattered weather stations with some adherence to almost adequate methodology and maintenance. Some of those are in rural locations. Inspecting those selected rural stations invariably reveals that temperatures are NOT increasing. For example, the Antarctic science stations Amundsen-Scott, Vostok, Halley and Davis show zero warming since 1957. Also, as to temps separated by latitude, only the polar North shows significant warming. Why is the only region with warming the same region with the least number of temperature stations. Why do related measures of temperature, such as NOAA Heat Wave Index 1895-2015, show that the 1930s were significantly warmer than present. The warmest periods of the MWP for Europe will be the reverse of the LIA, with warm continents and cold ocean phases, and with a dominance of La Nina and a cold AMO, which means a cold Arctic too. So where Esper et al (2014) shows a very warm late 700’s AD, GISP2 was at its second coldest period in the Holocene. The warm spike GISP2 right after 1000 AD is the Oort solar minimum. And 0.6C of it from adjustments as outlined by NOAA. How anyone would place any constructive faith in the recent thermometer record with its known biases from UHI etc, that may well be an order of magnitude grater than the trend they are sniffing for, is utterly beyond me. Karoly ‘running away’ from the debate is the most compelling evidence, just like he ‘ran away’ from the absurd Gergis paper. In terms of ‘credit as a witness’ his is down the sewer with Hockeyschtick Mann for mine, i.e. he has none. Pixie Dust science is his field. Its very big at the bottom of the garden I hear. How GISS can provide 1880 global anomaly or 1900 or 1910 or 1920 is beyond any reasonable argument. We have no idea what the 1900 anomaly was for global, with no data for most of the Northern Hemisphere and no data for almost ALL of the southern Hemisphere. “How do we know the defendant has not yet stopped beating his wife” point of view. If you are going to debate fairly, start with a neutral framing of the question. Neutral framing? You mean like this? “Karoly points out that over the last 800,000 years antarctica ice cores show that CO2 levels were constantly around 300 ppm. Thus indicating that human influence is apparent”. For my part I suspect this statement; due to the simple fact that CO2 has a far greater solubility in water than both oxygen and nitrogen. This must have had a considerable effect on the resulting constituents of gases in the ice bubbles dormant for thousands of years under considerable variations in the pressures etc. involved. There is no way I can substantiate this view; as it involves very complex calculations on molecule movements in such environments. This is a job for scientists. My enquiries on this indicated that much thought has been involved in this issue; but I gained the impression that no definitive answers had evolved. So it remains a large question mark in my book and I would be happier if significant changes in CO2 consentrations had been observed over the period, which I intuitively believe must have happened. How do we know that the higher levels of CO2 in the atmosphere are not due to ocean warming which will alter the exchange ratio between the ocean and the atmosphere. Whilst we do not know oceanic temperatures for the 19th or early 20th century, recent oceanic temperature rise is modest. and the CO2 out gassing that this minimal increase in temperature would cause is probably around 10 ppm. PS. I have not, late on a Saturday night, looked up the data and done the maths, but it that sort of ball park figure. Won’t ocean absorption of CO2 also decrease as waters warm? My understanding is that the higher level of C14 present in the atmosphere is how it is determined that human emissions are “solely” responsible for the rising CO2 levels. But if the ocean is absorbing less CO2, then would that not account for at least some of the higher ratio of C14 in the atmosphere? The solubility of CO2 in seawater changes with about 16 ppmv/degr.C (or K). That can’t be responsible for most of the CO2 increase. It is about the 13C/12C ratio (14 C is a radioactive isotope from the atomic bomb tests). There are only two main sources of low 13C: fossil organics and recent organics. All other inorganic CO2 (oceans, carbonate rocks, volcanoes,…) is richer in 13C. As the biosphere is a net absorber for CO2, it is not the cause of the declining 13C/12C ratio. So they had a contest and paid $5000 to Tamblyn to continue the debate. How crazy is that????? I see Tamblyn is his usual wordy self. I really wish they had gotten someone who was better at debating. Burying your opponent in a deluge of words just does not appeal to me. However, I do credit Tamblyn with cutting his own carbon footprint. He comes close to actually living out what he believes. I agree. His replies tarnished what had begun as a very good debate. He turned over the apple cart and went way outside the parameters established by Karoly and Happer, and into irrelevant nonsense. Happer and Karoly were really getting at the guts of the important questions, and Tamblyn made a mess of it. Dr. Happer has the patience of a saint. I don’t, he’s a plant hater. 2) Use of heavily adjusted, extremely badly located instrumental data borders on chicanery. 3) Use of substituted data smeared up to 1,200km from other instrumental data is likewise chicanery. 4) Claims that Antarctica is rapidly warming based upon smeared instrument data from cherry picked instruments up to 1,200km away makes for bogus global warming anomalies and circular reasoning. Crops grown, treelines, max glacier advance, max glacier retreat are natural responses to warmer and colder periods. That warmth dependent crops were grown in locations currently untenable to those same crops are excellent proofs for warm and cold periods. That alarmist alleged researchers, refuse to accept that crops requiring warmth grew over vast locales further north than is now possible is amusing when these same researchers willingly cite dubious proxies based upon hidden data. Got definitive proof for that claim? Absolutely definitive, not specious estimates based on personal opinions? * a) “Global” is not global, at all! * * i) Relative is a weasel word to hide major metrology networks ignoring and hiding accumulating temperature errors. * * According to this belief, the most modern, highest accuracy laboratory thermistor instrument offsets badly located thermometers with +/- 2.0°C accuracy ranges allowing “modern global average temperature” capable of identifying 0.9°C anomalies, globally. 2) Researchers have identified similar warming episodes with near identical slopes of increase in both the 19th and 20th centuries. Lost my interest right there. I’m sorry I read through this post. Your points are well taken and I agree with most of them. Sorry you did not like the post. Objectivity is impossible of course, but for Parts A,B and C I’m trying to keep my opinions out of sight and report what Happer and Karoly are saying in the documents I’m summarizing. My opinions are being saved for Part D.
Regarding CO2 rising at 2 ppm/year (IPCC estimate for 2002-2011), I think that is a pretty solid, but rounded number. The full Mauna Loa record (1959-2015) gives a slope of 1.5 ppm/year and shows slight acceleration. The estimates of fossil fuel produced CO2 are rough, but generally believed to be about twice the increase seen in the atmosphere. Thus the biosphere is picking up more, the oceans the rest. In IPCC AR5, Physical Science Basis, page 467, the actual numbers they estimated and the error bars are listed. Out of a total emissions of 555 PgC, 240 have remained in the atmosphere. The oceans took up 155 and biomass took up 160. These are not exact, but reasonable estimates in my opinion. That statement completely invalidates the notion that what we’re experiencing today is unprecedented. We just don’t know. These people could not see a climate turn coming if it hit them in the face. The reason why they can’t see it is because they do not know what causes the climate to change. If they did then they would be calling for a change. If I am correct (weakening magnetic fields solar/geo) then this year 2018 will continue to be the transitional year and cooling will continue overall thereafter. It is great to be in the minority when it comes to the climate. Bestest quote of the year…made my day. CO2 might have gone up due to emissions but the “observed” increase is no such thing. Michael Mann’s ‘Hockey-Stick Graph’ makes ‘the Piltdown Man’ look like a serious Science Discovery. Haven’t heard from him in ages in Australia, he would have been all over the MSM spouting the wild fires across the world as proof of man-made climate change. Karoly is a nasty little, small minded man. He shouts down anyone with an opposing voice. He continually ignores relevant science and information. The fact he stormed out simply proves he is very wrong. Climate change is not global warming or global warming is not climate change. If a relatioship between global warming and antropogenic greenhouse gases after 1951, as suggested by IPCC, present the relationship quantitatively to prove this theory. Otherwise all such discussions only serve timepass wasting time and energy. I keep saying it, over and over, there is no such scientific theory as “climate change”. Why? No predictive model that incorporates all of the relevant areas of research. If you have no predictive model, you have no theory. Karoly bailed out, and I am not surprised. he was involved in the very dishonest Gergis 2016 mess. There were a lot of lies coming from that team around that paper, that was exposed by FOI’d emails and the timeline McIntyre put together. Gergis then did an interview with the Conversation where she told patent falsehoods. I cited the lies in the comments section and provided the citations, and got a massage in my gmail a few days later telling me my comment was deleted. Indicative of the dishonesty of the MSM here is the opportunistic argument they run that the severe droughts experienced in central NSW and Qld are caused by climate change caused by us Aussies burning coal . As Australia only contributes 1.2% of world CO2 emissions of which coal burning would contribute no more than 30% of the 1.2 % its hard to see what effect we have on world or local temperatures -even if one accepts there is such a connection. Maybe these anomalies are due to holes in the CO2 layer which prevent those parts of the nation under the holes from heating ? The August UAH data is in, and it shows that despite all the media hype, the temperatures fell in August, and the anomaly is sitting at the 0.19 degC mark. One can see from the below plot that we are heading back towards 2002/3 territory. When we do not even know why living plants prefer different isotope ratio’s of C, N, K, H. S, Mg.
And what of the anomalous abundance of 16O17O18O Ozone? Is molecular chirality linked to isotope preferences in living processes? After all our atmosphere is part of the biosphere. I said last year this would be happening this year(lower overall temperatures) in response to weakening magnetic fields solar/geo . If I am correct in that the magnetic fields have much to do with the climate then it will follow that past tools used to forecast the climate will fail (if the magnetic fields are extreme enough either direction, in this case weakening ) unless they incorporated magnetic field strengths which we know they did not. That is the essence of my argument and why I am so against the models and trying to make this point, in my article which will be coming out soon. This is also why I am confident that the so called AGW is over. It comes down in large part to galactic cosmic rays and just how much influence do they have in global cloud cover and explosive volcanic activity. The evidence is there when one looks at the global electrical circuit and forbush events . If you get the cloud coverage wrong and do not incorporate major future volcanic activity in any fashion the climate forecast will not be correct. This is why I say how could any one think models in this environment will perform well, unless of course one thinks the magnetic /climate connection is hogwash. My two cents , but it is early and I know better then to celebrate more time is needed but I like the trend..
Seismic Monitor shows 30 day past earthquakes mag. 4.0 or higher up from an average of 680 to now 940! Here is a list of simple and easy to understand arguments upon which every climate change debate should focus. We need to KISS if we want to win this debate. Too often we get mired down in the Weeds. Climate debates should focus on the obvious flaws that anyone could understand. If we debate the minutia of the science, they win. They want to confuse the audience with endless meaningless details. Focus on the facts that carry the most bang for the buck. “Atmospheric Fingerprint”(cooling in the stratosphere and warming in the troposphere) From link: Another two observations show that CO2 is trapping more heat: Satellites measure less heat escaping to space at the precise wavelengths which CO2 absorbs; From what point in time compared what point in time? Since CO2 ppm is evenly distributed is the cooling in the stratosphere evenly distributed? 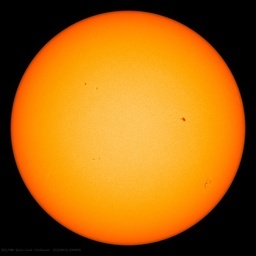 Surface measurements find this heat is returning to Earth to warm the surface. We know that, so what. From what I understand (IPCC report) the troposphere must be warming faster than surface temperature, am I wrong? An increased greenhouse effect would make nights warm faster than days, and this is what has been observed. Since when the sun goes down the SWR stops are nights, world wide, “make night warm faster than days” every 24 hour period world wide? “nights warm faster than days”: This seems to me to be an odd statement. I know, due to weather patterns, the day time temperature may be cooler than night time temperature for a short period of time but “warming faster” all night long? My opinion, speaking as a retired engineer, is that the most reliable proxy for temperature is the Global Mean Sea Level (GMSL). In a isostatically and tectonically stable region the primary factor affecting GMSL; has to be the global average ambient temperature. How does Karoly explain, in the absence of global temperature variations and the MWP, the global sea level variations throughout the Holocene in a region like South Africa. Pasted below is an extract from the South African Journal Of Science! KAT, agree that GMSL is a very good proxy as it essentially covers most of the planet. Though there is some mass-inertia in the land ice slowing down responses (and Antarctica is meteorologically isolated to a large extent). Still, it’s prb’ly one of the best proxies available. Refreshing to read the views of two intelligent people. If they differ so much from one another, it is apparent that more work needs to be done. — I’ve always thought that this question is largely irrelevant. It matters not a whit if CO2, or warming, is from human activities or if it’s natural. If warming is dangerous and we can do something about it, where expected benefits exceed the expected costs, then we should address it whether the warming is natural or not. Conversely, even if mankind is the proximate cause, if we cannot prevent such warning, then that should have an impact on how we decide to respond. Futile gestures that have no benefits are meaningless and wasteful. And if the warming is not dangerous, or if it is beneficial, then we should do nothing to prevent it from happening. In no part of the decision tree is it important whether mankind is the proximate cause of the warming or not.